Alexandre Decamps practiced an energetic, naturalistic style, employing rough brush strokes with strong contrasts between light and dark. His innovations were often met with criticism among the academic practitioners. He was one of the first, if not the first, painter to travel to the Holy Land for the purpose of representing scriptural themes in their most historically accurate settings. 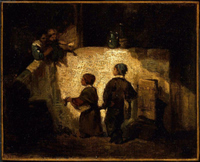 This small painting, while not a direct Biblical illustration, graphically portrays the poignancy of children who must beg for food in order to live. In the left of the painting, almost too dark to perceive, is a woman/man? holding a small child over high steps as the little one hands a piece of bread to the children below. Decamps, Alexandre-Gabriel, 1803-1860. Young Beggars, from Art in the Christian Tradition, a project of the Vanderbilt Divinity Library, Nashville, TN. http://diglib.library.vanderbilt.edu/act-imagelink.pl?RC=50303 [retrieved April 20, 2019]. Original source: www.mfa.org/.